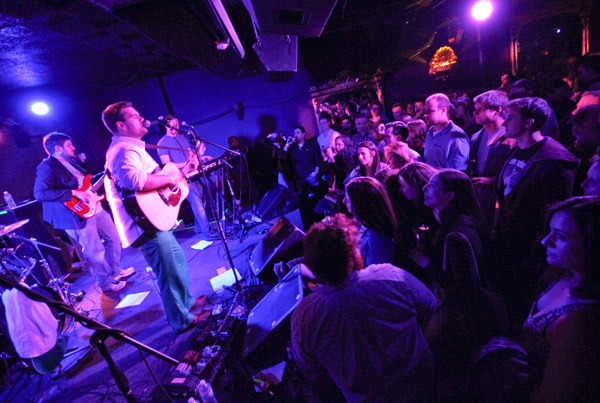 The Rock and Roll Hotel has played host to bands including Naylor Court, a group that formed on GW’s campus. This post was written by Hatchet staff writer Margaret Kahn. We’ve got one month left until finals take over and keep us on a route from dorm to Gelman to CVS (for requisite candy runs, obviously). Take advantage of your remaining free time and get off campus to attend any one of these rad events around the city. I’m normally not a proponent of the #onlyatgw hashtag, but there’s no denying how cool it is that Colonials can learn to tango at the embassy of the country where the famous dance was born. This three-part series of free Wednesday evening classes is for total beginners with no previous exposure to tango. You’re only asked to dress comfortably and bring a partner and a passion for dance. The Embassy of Argentina, 1600 New Hampshire Avenue NW, Wednesday, April 9 at 6:30 p.m.
Indie folk bands toe a fine line between dreamy nostalgia and over-the-top cutesiness. More often than not, Austin-based Wild Child comes out on the chill and comfortable side, with a seven-man lineup that includes banjo, violin, and cello. If you like soft and stripped-down harmonies between male and female vocalists (a la San Cisco, Metronome and Cults), this concert will wind down your week down nicely. Blossoms are now “puffy white,” according to forecasts from the National Park Service – meaning they’ll be ready to bloom this weekend. After a far-too-prolonged winter, this stalwart of spring is just what D.C. residents need. If you don’t mind fighting your way through the hordes of tourists, join in the city’s famed celebration complete with floats, blossom-inspired decorations and marching bands from across the country. If the promise of nature’s beauty can’t attract you, keep in mind that childhood pop icon Aaron Carter will be performing. Constitution Avenue, between 7th to 17th streets, NW, Saturday, April 12 from 10 a.m. to noon.